January’s distribution of the local option sales tax actually isn’t quite as bad as we initially thought. After carefully reviewing the numbers last week cities are only down 12% versus the initially thought 16%. Here are a couple of details from January’s numbers (November sales). Sales tax for municipalities in the aggregate is down 12% this past month, but we certainly know that each city and town is different. Each city relies on a slightly different economic makeup, meaning the recent economic downturn has impacted some communities more. The ULCT has clustered all 245 cities into twelve groupings to better understand this effect. 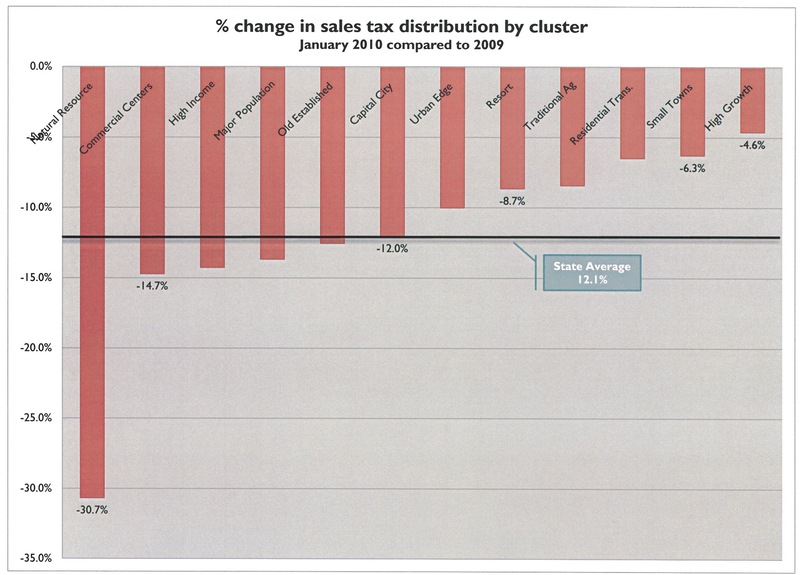 Below is a chart of the sales tax distribution for each cluster type of community. This past month was especially hard on many communities in the Utah basin (communities with an economy reliant on mining or natural resources), where January’s distribution is actually down 30% from the previous year.